At Global Self Storage Alexandria, we’re exceptionally proud of this offering, as we think it represents exceedingly well the level of our commitment to our customers to make moving the best possible experience it can be. We’re movers too, so we know what would be great features to have in a removalist company. That’s why we offer free move in vans, to our movers based in Sydneys Inner West and Eastern Suburbs (conditions apply). Besides having enough boxes and packing supplies, finding a vehicle to transport everything is one of the biggest concerns and least easily remedied problems for most movers. After all, who has an industrial-sized van sitting around waiting to be driven? Most people drive smaller cars, and those who do have large SUVs or minivans lose a lot of packing space by having seats and, quite often, people to transport on top of all of their belongings. Our free moving vans are the absolute perfect solution for those who are looking to relocate everything by themselves. 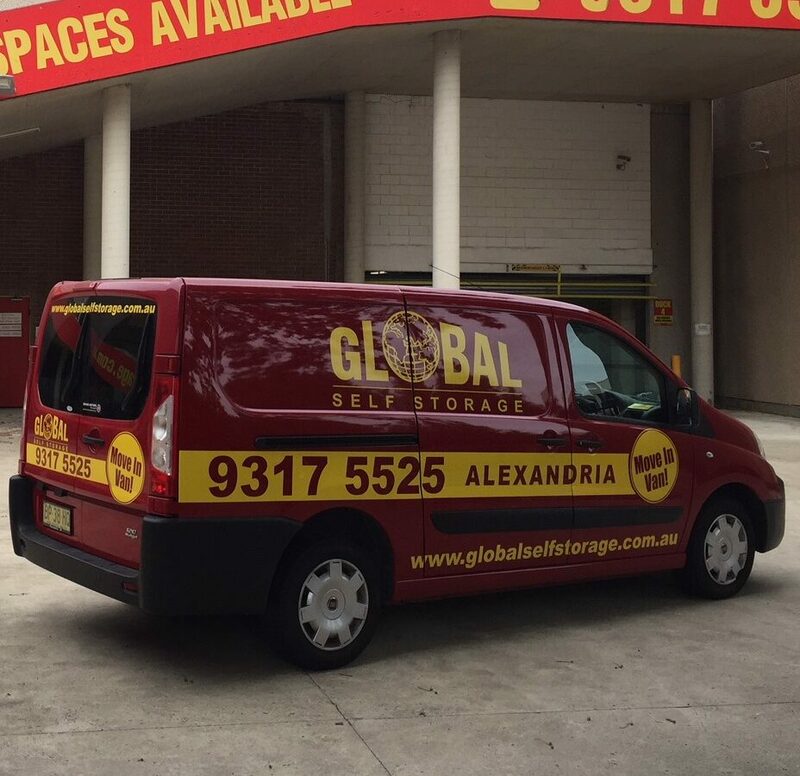 The official Global Self Storage Alexandria free move-in vans (also known affectionately as MIVs) have all the features you need for a nice, comfortable move between the shores in Australia. These vans have massive hauling space so you can fit far more boxes and loose items that you can in a conventional vehicle, and even offer enough singular space to fit larger objects that are too bulky for many SUVs and minivans with small backspace and seating-limited storage, making moving your bikes, dressers, armoires, jukeboxes etc. fast and easy. The insides are not just spacious, but are fully air-conditioned, meaning your ride is smooth, comfortable and safe for every type of possession you have to move. Concerned that driving a big van is too difficult? Even if you’ve never driven a large vehicle like this before, we assure you these are incredibly easy to maneuver and handle. There is no catch, if you’re moving with us and meet the modest requirements, you get a free van rental to help you make your move. Use the link at the top of the page for the van hire form conditions, and remember that Global Self Storage Alexandria is here to do everything possible for you and your next relocation. This service is available for hire by all of our storers, at a cost of $30.00 per hour – minimum of 4 hours + fuel.